in Jamaica Plain and Lowell - check us out! In conjunction with Lowell Winterfest, Liz is hosting a Valentine Gift-Giving Event at her shop, Lush Beads. There will be a raffle, sale of finished jewelry, and refreshments! Lush Beads is also part of the Winterfest Scavenger Hunt, which is from 6-9pm on Friday and 12-6pm on Saturday. Get at least 10 stamps from local businesses and you get a chance to win a Caribbean vacation/cruise! It's a great way to explore downtown. Who says Valentines have to be flowers and chocolate? Buy the one you love (especially if it's yourself!) a one of a kind, hand made gift at The Boston Handmade Be Mine Valentines Show. 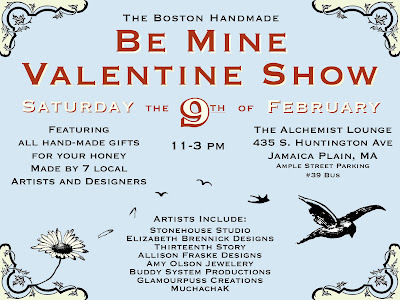 From 11am-3pm at The Alchemist Lounge in Jamaica Plain you can peruse some gorgeous wares such as Elizabeth Brennick Designs adorable baby doll tops and flirty A-line skirts and muchacha K's uber hip handmade purses. Valentines Day isn't only about your sweetie, don't forget! 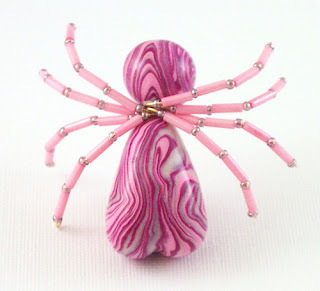 Get Mom a lovely polymer clay necklace or colorful bangle bracelet from Stonehouse Studio or your little ones a snuggly hat or sweater from The Hole Thing. Come by to shop and stay for brunch, enjoying The Alchemists hearty Irish Breakfast, delectable Eggs Florentine and out of this world Bloody Mary. See you there! Good luck to everyone this weekend!! !